Sweet potatoes and apples. Nothing more reminiscent of Fall than this combination….the light sweetness of the potatoes with the the tartness of the apples. 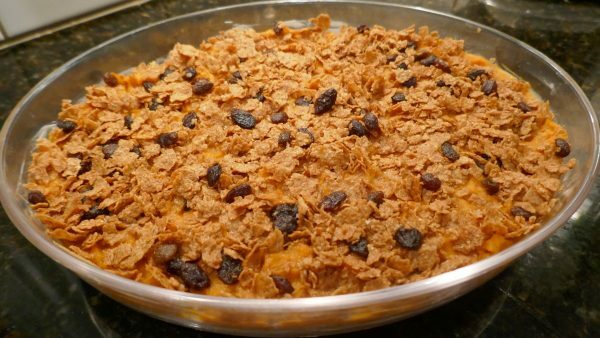 This recipe was in my cookbook but I have tweeked it a bit by adding a crunchy topping. Browning the butter and adding the salt to the raisin bran is transforming. Sweet potatoes can be processed in the food processor, white potatoes should not. This recipe can be done ahead. If frozen, do not add the topping until ready to bake. Brown butter makes everything better. If mixture is too stiff, add more bourbon! Can do up to 5 days ahead and refrigerate. Or, do ahead and freeze. Always add the topping when ready to bake.